A solo trip into one of the most remote places in the continental U.S., the Maze district of Canyonlands national park, offered some interesting challenges and an amazing experience in the solitude and splendor of the wilder desert landscapes. 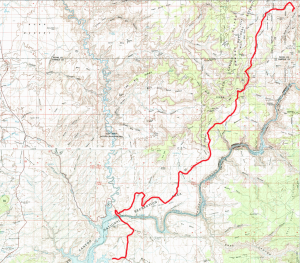 The route chosen for the six day 450-mile journey was almost completely off pavement (and off grid) apart from the initial and final sections of the loop that started and ended at Moab, UT. The primary goal of the trip was to get an overall introduction to the Maze district and work on preparing for logistical contingencies in remote environments. First light washed over the Maze imbuing the landscape with a purple hue that lasted a few fleeting moments. 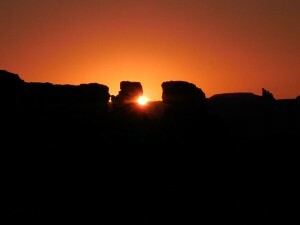 The silence of morning was almost loud as the rocks began to glow. My campsite was tucked into a fold of the ledge and invisible to the world. Not that there was anyone around to see. I was beginning the fifth day of self-imposed solitude deep in the mystical heart of the canyons. I wanted to linger, but I had to get a head start on the drive day, which was going to be a long one. I had about sixty miles of driving ahead of me, and though the last few would be back on pavement, there was still quite a bit of dirt to cover. After packing up camp, I couldn’t resist taking one final short walk along the rim of the overlook, stopping to just sit on a rock and gaze down into the chasm. I was feeling at one with the landscape. Over these past few days I have learned to see differently. I have gotten beyond “looking” at the land as “scenery,” to the point where I am interacting with it up close and personal, exploring deep inside it’s folds of rock, feeling its texture, becoming comfortable in its extremes. I have almost become a part of nature, finding my place with the birds and the small rabbit that is looking for food in the brush not far from my tent. There was something magical about this “transformation” that allowed me to see what I couldn’t see before. I could only imagine the experience of the true “explorers” who first mapped this area. My own journey was feeling pretty epic, as I drove back west towards the Orange Cliffs turning south along the edge of an interesting wash that I hadn’t paid much attention to yesterday. 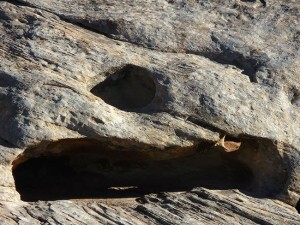 Today, re-energized, I stopped to “explore” the intriguing details of erosion at work. The rock wall below was like swiss cheese, a surreal pattern of holes, shadow and light, creating a post-modern sculpture accented with a few random flowers as if mother nature signed her name. Erosion’s handiwork was everywhere in the Maze, and with such variety of effect. Wind and water wear away at rock in different ways, creating deep gorges in some places, spires, arches and fins in others, depending on primarily two things — the type of rock being worn away, and the primary agent of the erosion. The canyons themselves were largely carved by the river waters, but the heavy monsoon rains of summer also scour the landscape, eroding some rock layers more quickly than others to create the strange balanced rocks and towers. The wind does its part, “sandblasting” holes into fins which eventually become arches or smoothing rock walls to an almost shiny flat surface. The history of each part of the landscape is detailed in the park’s Geological Resource Evaluation Report, which makes it clear that no rock is hard enough to resist the forces of weathering and erosion. Walking through the dry wash, contemplating the composition of holes and crevices as if I was looking at paintings in a museum, I realized how the process that created this amazing landscape would slowly transform it and maybe destroy it in the end, eroding the rock into flat boring nothingness. As much as this place is timeless and eternal, it is also ephemeral, and constantly changing. No two journeys here will ever be alike. I wished I had more time to wander and made a mental note to allocate quite a bit more time for any future Maze trip. Continuing southwest back towards Flint Cove, I enjoyed the drive. 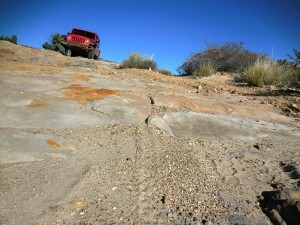 The trail had dried out from the last rain, and navigating the out-and-back part of the leg was simple. I had achieved a certain level of confidence and was moving swiftly, already thinking about the next “unknown” which would be my exit route from the park. I had chosen to make a “loop” rather than go back up via the Flint switchbacks. Though now that I had seen how impressive they were, I almost regretted my decision. Going back up the switchbacks would have been interesting to drive. I had made my original plan based on the idea that I would be able to experience a greater variety of terrain and get to see more of the landscape via the loop. I had a few more miles to go before I would have to commit to one way or the other, and I weighed the options in my head. There were a few spots on the approach to Bagpipe Butte where I had to pay more attention to the trail, with a series of dry wash crossings and a steep uphill climb ending in a sharp turn that revealed imposing parallel v-ditches, but nothing really technical. I was driving through Big Water canyon along a path that had been used by the cattlemen to take their herds to pasture in the Elaterite Basin. They would move the animals from one area to another depending on the availability of water, and there is actually a spring, known as Big Water Spring, further down in the lower part of this canyon. Apparently at the site of the spring there is evidence of the cowboy camps notably some graffiti etched on the rocks. I did not have time to look for it this trip, but added it to my list for next time. The terrain was changing again as I reached the crossroad where I would have to make a decision about my exit route. The red rock canyon walls transitioned back into the grey earth that looked like cement. Today’s sunlight brought out the textures and the earth seemed to have more vibrance and color, despite the grey tone. I took a short break to explore a bit while I mulled over my options. An important consideration was how much fuel I had left. With the long distances across the terrain in different directions, and no gas stations for many miles, it was critical to keep track of how much fuel I had and how much mileage I still had to cover. I had carefully calculated all that for my original route, and with the spare ten gallons in the gas cans, I would have more than enough if I followed my plan to exit via Hite. If I changed my route and went back via the switchbacks I would have to get all the way to Hanksville for gas. I had been paying attention to fuel usage during my time out here, only using 4-Lo when I really needed it, and trying to drive in “eco” mode as much as possible. I probably had enough gas to go either way, but caution won out, and I decided to stick to my planned route. Looking at the “bright side” of my decision, I figured I would at least get to see some different terrain going out this way, and I wouldn’t have to go back over that horrible washboard section on the road near Hans Flat. I turned in the direction of Highway 95, and said a silent “goodbye” to canyon country until next time. There were 33 miles to go this way before reaching the tar road, and I settled in for what I imagined would be a kind of “boring” drive out. I was pleasantly surprised as I climbed the gentle slope back up the ledge and turned onto an expansive overview of the whole range of landscapes below. I could see all the way to the La Sals. The trail wound along this ledge with a few tight turns accompanied by the most incredible vistas at each twist. A final section wrapped around the cement-like terrain, in an otherworldy hairpin, followed by a moderately steep descent down to Waterhole Flat. Though less “technical” than the switchbacks this route had a drama of its own, and I was glad with my decision to take it. Back on a nice easy dirt road, I was clearly out of the canyons traveling through a more accessible part of the Glen Canyon National Recreation Area. The “recreation area” actually includes 1.2 million acres of golden cliffs, hanging gardens, slot canyons and waterways that cross both Utah and Arizona. It is an administrative section of public lands centered around Lake Powell, a massive reservoir on the Colorado River, which was created by the building of the controversial Glen Canyon Dam. The dam flooded the canyon irreversibly destroying an incredible part of the wilderness. Ironically, the resulting lake was named for the explorer who had inspired so many to make a river trip that is no longer possible. The controversies over public land, wilderness and how to manage it all continue, though they were far from top of mind, as I drove on through the desert appreciating all the incredible landscape we do have access to. The road wound its way through flat red sandy desert dotted with lush green plants and at one point I thought it would go on forever. I felt myself getting tired and bleary eyed, but I still had to pay attention to the trail because every now and then there would be an unexpected dip or a section that was a bit washed out. The stretch of monotony broke after a slight turn revealed a new landscape and my eyes lit up with renewed interest. In the middle of seemingly nowhere where more rock walls and formations standing on the horizon like yet another ruined acropolis. Of course it was not as “grand” as what I had seen inside the park, but it was quite impressive on its own. And maybe even more so, because it was unexpected and so relatively accessible. I could park the Jeep and walk right up to the edge of the rock walls and between formations, or wander in the other direction across the flat cracked earth. It was like the desert and the canyons intersected here. Time limited my exploration, as I wanted to get to Hite before dark. I had no specific campsite for the night, and I would have to scout out a suitable spot somewhere. Though Hite was “civilization” it was barely any kind of town — mostly just a Ranger outpost and a gas station. In warmer weather the area might be more crowded with people accessing the lake, but at this time of the year I didn’t expect to encounter many other visitors, and I knew the little general store would be closed. I had identified some possible spots for camping not far from the “town” but really had no idea what the terrain would actually be like, and definitely wanted to set up camp while it was still light. As I got back on the trail, I made another mental note for “next trip” that not all the interesting terrain is “in” the park. There were just a few miles left to pavement when my “gas light” lit up, warning me to get gas. I was so close to a gas station and really didn’t want to have to start manipulating gas cans and siphoning at this point. I decided to take the risk that the computer was wrong and my own calculations were right. The Jeep’s electronic gas indicator has one flaw — it does not say how “much” gas is left in gallons, rather it computes how many miles the vehicle can travel in the current mode with the gas remaining in the tank. And when the computer determines that the driver should start looking for gas, it lights up, and stops displaying “remaining miles.” I continued towards the road, and the bridge that crosses the confluence of the Colorado and Dirty Devil rivers. Turning off dirt and onto Highway 95 felt almost strange. But the road was empty and my solitude unchanged. I arrived at the Hite “gas station” a few moments later, relieved that I’d made it. After filling up, I could calculate that I had had a little over one gallon left (and the untouched ten gallons in gas cans). Hite was even smaller than I’d imagined. There was no town, just a sort of “compound” with what looked like one road and a few small houses, the ranger station, and the combination gas station/general store which was closed — though thankfully the self-serve pumps remain functional 24/7. Past the compound and Ranger station there is a campground and public launch ramps, thought I understood that due to the lake’s water levels they were not in service. The small settlement has been here since the 1880s when Cass Hite found gold in the sands and gravel along the Colorado River, setting off a small gold rush. 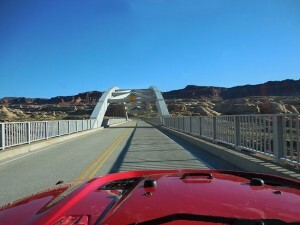 Hite had learned from the local Navajo that the best spot to ford the Colorado was near the mouth of the Dirty Devil River, 2 miles downstream from the present-day bridge location. He built a cabin and a small store to serve the miners here and a post office was established in 1889, making the “town” official. There was no ferry crossing in those days, just a decent spot to ford in the river. Cass and his brothers operated the crossing and prospectors used this place as a rendezvous point, but the only thing the miners found was fine gold dust too difficult to recover, and mining operations petered out. Though the area around Hite seemed somewhat deserted, I didn’t really want to camp so close to “civilization” and so after gassing up, I continued a little further south on Highway 95 until the dirt turnoff for Farley Canyon. 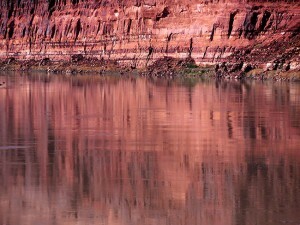 This canyon opens onto a bay which provides access to Lake Powell. It seemed a perfect spot to camp, and I followed the track in, looking for a decent flat spot to set up camp as the sun was already behind the canyon wall, casting a long shadow across the terrain. Along the shore there are small inlets with smooth slickrock at the edges, remote and peaceful in the middle of sublime canyon scenery. I found a spot where someone had built a fire ring at some point, and though there were some weeds growing up through the rocks, I considered it a decent site to set up camp. Working quickly, I got the tent in place and started my fire as the last light faded into darkness. Enjoying the warm glow of a wood fire again, I kept my small bonfire going under the stars until almost midnight. This was my final night in the wilderness and I wanted it to make it last. As I finally settled in to sleep, I heard the coyotes howling and smiled to myself — everything was perfect. 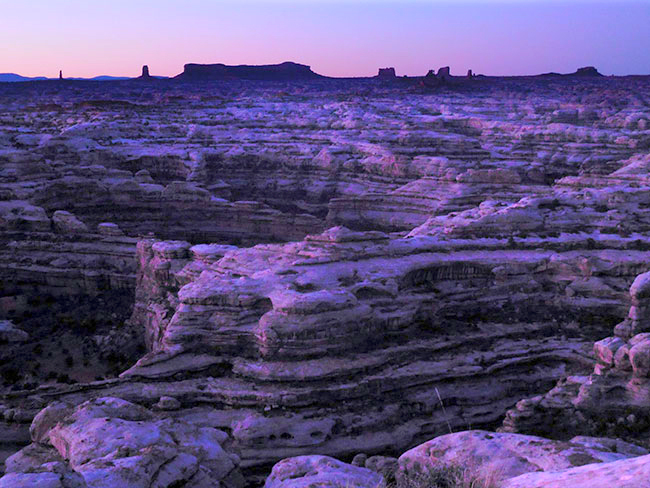 The Maze is one of three distinct districts of the Canyonlands national park, located near Moab, Utah. 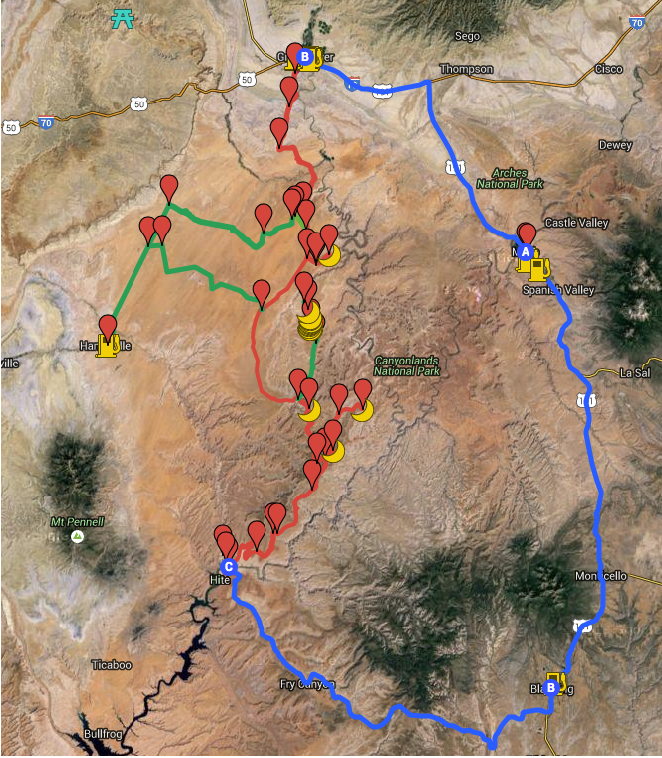 This journey loops north of the town of Moab, then west to Green River and south into the San Rafael desert to reach the Maze district of the park, continuing south into the Glen Canyon Recreation area and then east to Blanding and back north to close the loop. Driving back the way I came for roughly 12 miles, I head west then south over the same terrain I drove yesterday, to the main “junction” of trails near Flint Cove. 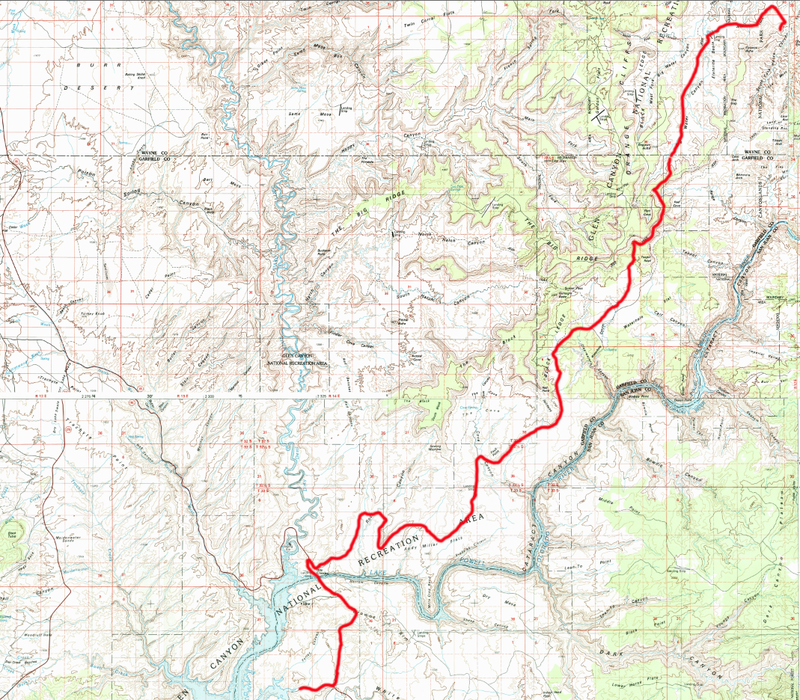 From there I will begin the southern exit route to the Hite Crossing, rather than returning up the switchbacks. This route is less interesting from a technical driving perspective, however it offers amazingly spectacular views over the canyons all the way to the La Sals. The route follows a high ledge road that turns southward and descends out of the canyons onto a flat open plateau with a nice easy dirt road through some interesting and varied desert terrain heading generally west-southwest for most of the last half of the journey back to pavement. The last leg goes on the tar road across the bridge over the Colorado river into Hite where gas is available, then a final few miles to another dirt access road into Farley Canyon where I decided to set up camp for the night between the canyon walls and the river. The vast landscape of Glen Canyon National Recreation Area contains rugged water- and wind-carved canyons, buttes, mesas, rivers, seeps, springs, and hanging gardens stretching across 1.2 million acres of southern Utah and northern Arizona. It borders Capitol Reef National Park and Canyonlands National Park on the north, Grand Staircase-Escalante National Monument on the west, Vermilion Cliffs National Monument. the northeasternmost reaches of Grand Canyon National Park on the southwest and the Navajo Indian Reservation on the southeast. Established in 1972 with the dual purposes of safeguarding the land for “preservation” and “recreation.” These sometimes conflicting goals have meant that part of the land has been developed for access to Lake Powell via 5 marinas, 4 camping grounds, two small airports, and houseboat rental concessions, while other areas are more protected. Currently about 588,855 acres (approximately 51% of the total land area) are being considered for wilderness designation. 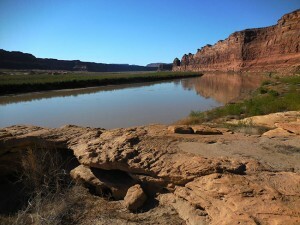 The rugged terrain was shaped by the Colorado River and its many tributaries, including the Dirty Devil, Paria, Escalante, and San Juan rivers, carving through the Colorado Plateau to form a dynamic complex of desert and water environments. The Recreation Area also preserves a record of more than 10,000 years of human presence, adaptation, and exploration. This place remains significant for many descendant communities, providing opportunities for people to connect with cultural values and associations that are both ancient and contemporary. This journey was made in a 2015 4-door Jeep Wrangler Rubicon sourced from Barlow Adventures in Moab, UT. Traveling alone in such a remote area made vehicle capability and reliability top priority. Barlow’s Jeeps are professionally modified specifically for Moab’s adventurous trails and back roads, with 3″ suspension lifts, 33″ heavy-duty off road tires and extra undercarriage armor. The company has an outstanding reputation within the off-road community for the quality and condition of its Jeeps as well as for the general support provided. 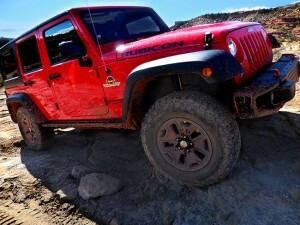 The specific Jeep used for this trip was a Hard Rock edition with about 6,000 miles on it equipped with BF Goodrich KO2 tires and in top condition. There would be no worry about mechanical breakdown and the Jeep was more than capable of facing any of the terrain challenges expected on this route. 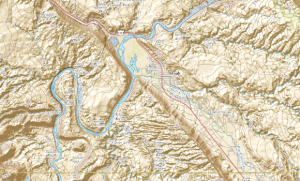 For more detail, National Geographic Trails Illustrated maps were used. 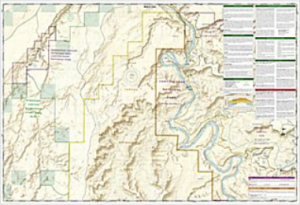 These printed maps come on reinforced water-proof and tear-resistant material, and include detailed information on recreational trails and points of interest. There are several maps that cover areas included in this journey, though the most critical are the Maze and Canyonlands maps. An important note: be aware that the Maze district map DOES NOT show the Hans Flats Ranger station or the exit to Hite Crossing. NOTE: This is the fifth in a series of segments highlighting details of a solo Jeep trip into The Maze district of Canyonlands national park, in Moab, UT. All text and photos are copyright JoMarie Fecci/USnomads unless otherwise noted. If you would like to use any imagery here, please contact us for permission. The trip was conducted in October 2015 by JoMarie Fecci of US Nomads. For more information about the specifics contact us.